2014.9.28(Sun) ”CREATE THE WORLD” TOUR FINAL公演のゲストバンド決定!! ”CREATE THE WORLD” TOUR FINAL公演の詳細が決定!! wrong city ”Induction Of Otherside TOU R2014” 出演決定! wrong city ”Induction Of Otherside TOUR 2014” 10月に計6会場でMELLOWSHiPの出演が決定!! 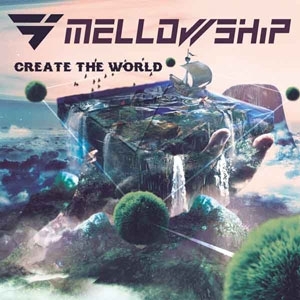 NEW ALBUM "CREATE THE WORLD"の核心に迫る!! ”CREATE THE WORLD” TOUR 2014決定!! NEW ALBUM"CREATE THE WORLD" RELEASE!!!!! それに伴いRELEASE TOUR ”CREATE THE WORLD” TOUR 2014決定!!!!! NEW ALBUM “CREATE THE WORLD” 発売決定!! 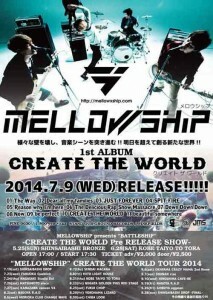 2014.07.09 NEW ALBUM"CREATE THE WORLD" RELEASE!!!! !